The Eastern Oyster (Crassostrea virginica) is the official state Shellfish of Connecticut. 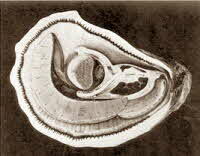 Mississippi designated the Oyster Shell (Crassostrea virginica) as its Official State Shell in 1974. The Oyster Shell was designated as the Official Shell of Virginia in 1974. Americans eat more oysters than anyone else in the world.